Yes, planning a wedding is stressful. And it can easily cause you to feel stressed out. Plus you're making a huge commitment to someone, so it's natural to get freaked out. But pre-wedding jitters are super common and natural. Here's how to calm them so you can actually enjoy your wedding. You're not the only bride who feels overwhelmed. 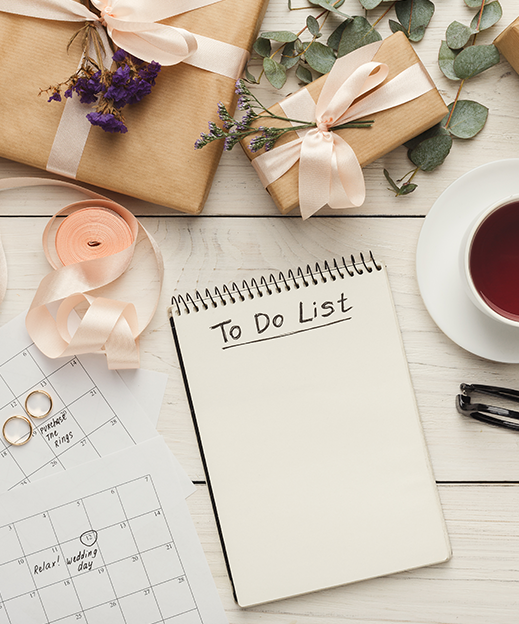 Wedding planning can make anyone feel anxious -- even anxious enough to have second thoughts about getting married. Rather than canceling your wedding, you should confide in other brides and rely on them as a support system. Or turn to your best friend who can act as a sounding board for your thoughts and feelings, and serve as the voice of reason. Part of pre-wedding jitters is feeling irritable. Maybe things that didn't bother you before bother you now. But this feeling is all due to stress and anxiousness. You can put things into perspective and feel more positive by going on a date with your fiancee. Make sure to discuss anything but the upcoming wedding to give you both a much-needed break. Because getting married is a life-changing commitment, you might find that, along with experiencing second thoughts, you have difficulties eating or sleeping. This is natural, too. You should reach out to close friends or even find a therapist to help you overcome this hurdle. Remember all these things are just temporary. Restorative yoga. Engage in restorative yoga on a consistent basis to help calm your nerves. Yoga poses should be focused on deep breaths to soothe your mind. You'll find that you're more connected with your body and mind. Breathing exercises. Breathing exercises can help change your internal state within a matter of a few minutes. Why? Because it calms the nervous system. Try taking 10 deep, slow breathes at a time, focusing your attention on the present moment. Drink anti-inflammatory beverages. Anti-inflammatory drink, such as turmeric lattes, can help reduce your anxiety. Magnesium vitamin B complex supplements also do the trick. You'll notice you're calmer and able to more effectively deal with daily stressors. Meditation. Meditation has been proven to reduce anxiety and depression when practiced on a daily basis. There are two different types of meditation people use -- concentration meditation and mindfulness meditation. Both are effective in helping you to feel calmer. It's important to also minimize any other stressors in your life so that you can reduce your stress and anxiety. What's more, don't be afraid to ask for help if you feel overwhelmed. Remember that pre-wedding jitters are totally natural. Everyone experiences them. But, to overcome pre-wedding jitters, it's essential that you draw on your support system, whether it be natural supports, such as friends and family, or more formal supports, such as a therapist. You can also incorporate wellness techniques into your daily life to ease your anxiety and stress, whether it be yoga or meditation. Pre-wedding jitters are temporary, too -- once you've tied the knot, you'll feel so much more relaxed! "6 Easy Ways to Deal with Wedding Jitters," Huffington Post, March 25, 2015. "4 Wellness Techniques That Calm Pre-Wedding Jitters," Brides, January 11, 2018. "Calming Pre-Wedding jitters," Psychology Today, March 21, 2018.